248 pages | 29 B/W Illus. This collection of contemporary original writings explores these issues in a range of specific contexts, and through employing a range of theoretical and methodological approaches. The relationship between higher education and social mobility has probably never been under closer scrutiny. 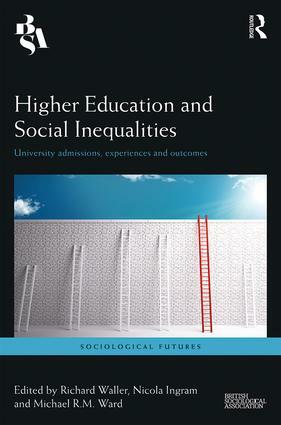 This volume will appeal to academics, policy makers, and commentators alike.Higher Education and Social Inequalities is an important contribution to the public and academic debate. Dr Richard Waller has taught sociology in higher education since 1995, andis currently Associate Professor of the Sociology of Education at the University of the West of England, Bristol. He has published widely on higher education and social class, and is currently co-writing a sociology of education textbook for Routledge and co-editing an international handbook of lifelong education for Palgrave (both due for publication in 2017). At present he is working on the second three-year phase of the Leverhulme Trust funded Paired Peers project which followed a cohort of undergraduate students studying at Bristol’s two universities. Richard was co-convenor of the BSA’s Education Study Group (2009-2013) and is on the editorial board of four journals including the British Journal of Sociology of Education. Dr Nicola Ingram is a lecturer in Education and Social Justice in the Department for Educational Research at Lancaster University and co-convenor of the British Sociological Association’s Bourdieu and Education study groups. Her research is broadly focused on social inequalities in education and she is particularly interested in issues of identity, class, gender and ethnicity in young people’s transitions. She has published widely on these areas. Since 2010 Nicola has been working on the Paired Peers project (with, amongst others, Richard Waller), and this was the source of the co-authored 2016 Palgrave book Higher Education, Social Class and Social Mobility: The Degree generation. Dr Michael R.M. Ward is a lecturer in Applied Social Sciences at Swansea University. His work centres on the performance of working-class masculinities within and beyond educational institutions and he is the author of the award winning 2015 book From Labouring to Learning, Working-class Masculinities, Education and De-industrialization (Palgrave MacMillan). He is also the editor of Gender Identity and Research Relationships in the Studies in Qualitative Methods book series (Emerald). Mike is co-convenor of the BSA Education Study Group and editorial board member for Sociological Research Online and the Journal of Boyhood Studies.